Students who attend high schools focused on deeper learning are more likely to graduate than students at other schools, according to a follow-up study from the American Institutes for Research (AIR). 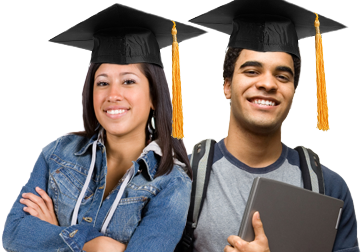 The study, Graduation Advantage Persists for Students in Deeper Learning Network High Schools, defines deeper learning for students as developing both a set of competencies (mastery of content knowledge; complex problem-solving, communication, and collaboration skills; an understanding of how to learn; and academic mindsets) and a way of learning that promotes these competencies. 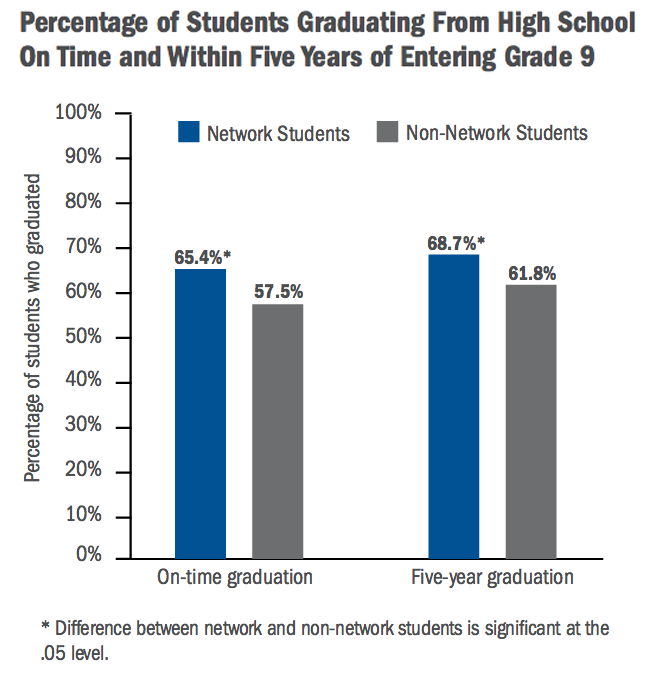 In the study, 65.4 percent of students from deeper learning network high schools graduated within four years compared to 57.5 percent of students at “non-network high schools,” as the graph from the report to the right shows. Students from deeper learning network high schools had higher five-year extended graduation rates as well. The positive effects of attending a deeper learning network school were similar for both male and female students and for both low- and high-achieving students, the report notes. The study also finds positive effects—albeit smaller—among students eligible for free or reduced-price lunch (FRPL). Among students eligible for FRPL, 60.9 percent of students at deeper learning high schools graduated within four years compared to 56 percent of students at comparison high schools. Meanwhile, among students not eligible for FRPL, 69.7 percent of students at deeper learning high schools graduated within four years versus 56.4 percent of students at comparison high schools. This latest study updates findings from AIR’s 2014 Study of Deeper Learning: Opportunities and Outcomes, a series of three reports that examine outcomes from a set of high schools associated with ten established networks from across the country that embrace the goals of deeper learning. [i] The 2014 study—funded by the William and Flora Hewlett Foundation—“aimed to determine whether students who attended high schools with a mature … and at least moderately well-implemented approach to promoting deeper learning experienced … better outcomes than what they would have experienced had they not attended these schools,” the new report explains. In AIR’s original Study of Deeper Learning, students attending deeper learning network high schools (1) reported higher levels of academic engagement, motivation to learn, collaboration skills, and self-efficacy; (2) scored higher on state achievement exams and the PISA-Based Test for Schools;[ii] (3) graduated from high school on time at higher rates; and (4) were more likely to enroll in four-year postsecondary institutions than students at comparison high schools. 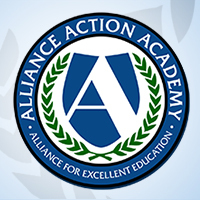 The new Graduation Advantage study expands upon these findings, adding two more matched pairs of deeper learning and comparison high schools and a fourth cohort of students, allowing researchers to analyze graduation data for students who entered ninth grade between School Years 2007–08 and 2010–11. The researchers note, though, that the findings from both studies represent effects “for the particular group of network schools included in the study and cannot be generalized to the larger population of [deeper learning] network schools,” the new report says. Nonetheless, “[t]he updated results extend our earlier work showing that students attending deeper learning network high schools were more likely to graduate on time than similar students at non-network [sic] schools,” says Kristina Zeiser, lead author on the new study and a senior researcher at AIR. The new report, Graduation Advantage Persists for Students in Deeper Learning Network High Schools, is available at http://www.air.org/sites/default/files/downloads/report/Graduation-Advantage-Persists-Deeper-Learning-Report-March-2016-rev.pdf. The original Study of Deeper Learning: Opportunities and Outcomes series of reports is available at http://www.air.org/resource/deeper-learning. Additional information about deeper learning and the network of schools featured in the reports is available at http://deeperlearning4all.org. The report defines non-network high schools as schools located in the same geographic area as the network schools that had comparable student populations, based on student demographics and academic achievement. [i] The ten networks of schools in the study are Asia Society, Big Picture Learning, ConnectEd, EdVisions Schools, Envision Schools, Expeditionary Learning, High Tech High, Internationals Network for Public Schools, New Tech Network, and New Visions for Public Schools. [ii] The PISA-Based Test for Schools, administered by the Organisation for Economic Co-Operation and Development, assesses core content knowledge and complex problem-solving skills.